To the wild plant enthusiast, the seasons are similar to mans life; spring is the time of new birth and childhood. Life begins to stir from the earth and flowers spring forth in a glorious array of colors. Later, as the earth matures and summer brings heat and dryness, life seems to settle back into patiently waiting for the heat of summer to pass. Finally, as the days begin to cool and rains to return, a change occurs..... Nature seems to spring back to life as the plants of Fall begin to shake off the Dog Days and show off their blossoms of reds, whites and yellows. Early fall always brings about many surprises for this forager as the heat of summer begins to ease and cool mornings bring me out of the dog days. Around this time, my heart starts pumping a new rhythm in anticipation of rambling in the woods again. As I cruise the hills and hollows of North Alabama, I can see, standing like a silent sentinel in the haze, the unmistakable stalks of Life Everlasting, the Rabbit Tobacco beckoning me to stop and inhale their aromatic leaves full of energy and power. If there is any one plant that represents the change of seasons from summer to fall, it is Rabbit Tobacco. Around the middle of August, it is hard to miss the silvery-green leaves of this plant dotting the hillsides of the Deep South. All the way through winter, even with snow on the ground, it appears tall and alive seeming to gain strength as the seasons change. Rabbit Tobacco, and its many similar cousins, is a wide ranging plant found from Texas on east and from Canada to Florida. Unless you are west of Texas and Oklahoma, odds are that you will be able to find some form of Rabbit Tobacco mixed in with Summer Boneset, Goldenrod and Asters. Known as a pioneering plant, Rabbit Tobacco loves to invade dry slopes and hills where it will reach as high as three feet tall in some locations........ Around Anniston, Alabama at the foothills of Mt. Cheaha, Rabbit Tobacco will be found waist high and in very thick patches. I have a friend in South Alabama who spent many years and adventures with the Navy tracking Russian satellites. Trained as a chemist, he has come in very handy when I needed a bit of plant analysis performed and was more than happy to run the gas chromatograph on Rabbit Tobacco for me. To say the least, I was very surprised by the results of his tests although I have always known that this plant is a power medicine chest of healing properties. The primary healing chemicals found in Rabbit Tobacco are called Tepenes and have demonstrated an ability to positively affect cancer (cytotoxic) and viral infections (viricides) such as the common cold and influenza. There are also chemicals known as sterols and saponins which demonstrate healing effects upon the human body. These chemicals are soluble in water as well as alcohol; the mode of action differing upon which manner you choose to extract the medicinal properties. Either way, it does not take a lot to positively impact health. A spoonful of the dried leaves in an infusion of hot water reduces the length of any viral infection while, at the same time, soothing the irritating cough and expelling mucous built up in the lungs. Dr. James A. Duke in his U.S. Department of Agriculture database of edible and medicinal plants lists members of this family being: anti-hepatomic, anti-mutagenic, anti-tumor (lung), anti-tumor (ovary) and immunomodulator. In the Peterson Guide to Medicinal Plants Eastern/Central edition, James Duke and Stephen Foster provide uses more commonly understood; sore throats, pneumonia, colds, fevers and diarrhea. They also state that the fresh juice is an aphrodisiac although other sources actually list it as having the opposite effect upon the libido. On the terrific website, Plants for a Future, it is listed as a diaphoretic, diuretic, expectorant and astringent. This site also lists it as an anaphrodisiac. However you choose to use this plant, it is powerful and works for a wide range of ailments. Rabbit Tobacco was one of the first plants my teacher Tommie Bass introduced me to. It didnt matter what time of year I visited his shack, he would have large bundles of the plant drying in his open sheds out back. It always amazed me how an elderly man with no car could manage to get out and pick 20 or 30 pounds of these plants to hang alongside the great bundles of aromatic Mountain Mint and dried brown sticks of Yellow Root. I was in my 20s when he showed me how to smoke the dried leaves in an old corncob pipe and blow the smoke out my nose. Strong and with a definite bite, I learned that Rabbit Tobacco did indeed open up the sinuses and dry mucous membranes. Later, Tommie taught me how to make his famous cough and cold tonic composed of many different local herbs. An important part of the formula was to always have a large double handful of dried Rabbit Tobacco leaves. He explained that when a person drank the tea, the Rabbit Tobacco helped to dry up the lungs and cause all of the congestion and phlegm to come up and out. Although Tommie did not know what terpenes were, he did know that if you had a raw, sore throat, a cup of hot Rabbit Tobacco tea would calm and soothe it in a few minutes. Not surprisingly, the knowledge Tommie Bass had of Rabbit Tobacco went back much further than his early 20th century herb practice. Trained by a Black mid-wife and a Cherokee healer, Tommie was simply continuing a long practice of employing Rabbit Tobacco as a medicinal. Pre-dating him, the native cultures of this continent employed the leaves and flowering top for a wide assortment of uses ranging from purging the system of toxins to purging the home and mind of evil spirits. Close to home in the southern Appalachians, the Cherokee used the leaves in sweat baths, as a sedative for sleepless nights due to nervous complaints, colds and as a local pain reliever for muscle cramps and arthritic pains (Chiltowski, 1975). The Creeks of the Muskogee nation used Rabbit Tobacco for many of the same uses and for the mumps, vomiting and as a psychological aid (BAE Annual Report). Other Indians tribes representing the entire East Coast employed Rabbit Tobacco for similar uses., with the Rappahannock smoking the leaves in a pipe for asthma (hmmm.... now I know where Tommie got that from). Over the years, I have found that Rabbit Tobacco has become one of the top ten herbs in my pharmacopoeia along with herbs such as Sumach, Smartweed and Bloodroot. I have found myself picking many pounds of the leaves to add into my cough tonics, as a smoke for asthma, a specific for bronchitis and pneumonia and as a generalized pulling astringent in the famous salve formula Tommie handed down to me. I honestly dont know what I would do without this wonderful plant. I found that Rabbit Tobacco can even take away the urge to smoke if used properly. When my son was seven years old, he told me, out of the blue, that he wanted to learn how to smoke. After thinking a minute on this, I went and got an old corncob pipe, filled it full of Rabbit Tobacco and puffed until the leaves were glowing with red hot intensity. I then handed it to my son and told him to inhale as deeply as he could. In went the smoke and out came the smoke from his lungs in a mighty gray blast accompanied by coughing and gagging and a slight shade of green taking over his face. Needless to say, I never heard him mention smoking again! There are many ways to prepare and use Rabbit Tobacco but there is one major consideration involved with the use of this plant. It is critical that it is picked AFTER the leaves have turned their traditional silvery-green color in the fall. Until then the chemical constituents are not fully developed and medicinal value of the plant is poorly developed. Most of the terpenes and saponins are not present, and any infusion or tincture made will not be very effective. That being said, Rabbit Tobacco is very simple to use, whether it is as an infusion, a tincture, smoking mixture or, in its most powerful form, a true distilled extract. A spoonful of the dried leaves steeped for five minutes in a cup of boiling water will soothe coughs, open up the sinuses and act as an expectorant. 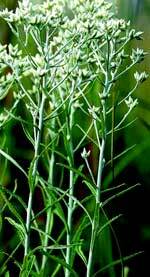 Swallowed, its healing astringent nature is particularly beneficial to inflamed tissues of the stomach and intestines. Amoebic and bacterial forms of dysentery respond well to an infusion of Rabbit Tobacco alone or in combination with Blackberry roots. I particularly love this manner of use since it rapidly kills the bad bugs while having a drying effect upon the colon, acting as an herbal equivalent to Immodium. Externally, a poultice or fomentation of the leaves is wonderful for cuts, scrapes and wounds that are slow to heal. It is one of the essential herbs to use in salves for this purpose when it is available. A liniment can be made of Rabbit Tobacco leaves and rubbing alcohol for the treatment of sprains and muscle aches. In alcohol, Rabbit Tobacco readily proves its effectiveness in short-circuiting viral infections. A few drops of tincture or extract in a cup of warm water makes a soothing tea which brings a flush to the internal organs, raises the core body temperature and produces a cleansing sweat to a sick body. Along with reducing the temperature, terpenes in the Rabbit Tobacco also serve to kill the virus attacking the system. This will halve the time it takes to overpower the virus and recuperate. Rabbit Tobacco is also known as Life Everlasting and can be found standing proudly throughout the Fall and Winter, a virtual medicine beckoning us to discover it. As I walk the hills and valleys of North Alabama this time of the year, I cant help but feel a sense of excitement as I see this wonderful plant popping up among the Asters and Goldenrods. No matter what time of year, whether it is the new birth of Spring or the mature sleep of Winter, nature offers us many useful herbs. What always to amazes me is the ways in which nature provides just the plants we need to treat our ills, to feed and to clothe us. Each season is unique in what it offers. Fall is no different as plants such as Rabbit Tobacco appear just in time for the cold and flu season ahead. Nature has many wonderful gifts to give us with the passing of each season. Spring offers cleansing tonics to bring us to life after a long Winter, Summer offers a bounty of fruits and vegetables and Fall prepares us for the rigors of the Winter to come. Rabbit Tobacco is just one of many healthful herbs available for the sharp forager of plants. Stephen Foster and James A. Duke - Peterson Guide to Eastern/Central Medicinal Plants. 1990.